On this page you’ll find answers to some frequently asked queries in relation to Educate Together. We’re here to help – get in touch with the national office if you have any questions! Educate Together is the patron body of the growing network of equality-based primary and second-level schools in Ireland. It is an independent NGO that runs schools that guarantee equality of access and esteem to children, irrespective of belief system, race, ethnicity, class, culture, gender, language, lifestyle and ability. Educate Together schools are learner-centred and are run as participatory democracies, with respectful partnership between parents, pupils and staff. Today there are 84 primary schools and 13 second-level schools in the Educate Together network. The organisation became a company limited by guarantee in 1998 and has charitable status. It has a national office which provides representative and support services to existing schools and campaign groups. The Board of Directors of the organisation work in a voluntary capacity. What do school 'patronage' and school 'ethos' mean? Every school in Ireland has what is known as a ‘patron’. The patron is the body that establishes the school, appoints the Board of Management and directs the ‘ethos’ of the school. School ethos generally refers to the core shared values, beliefs, attitudes and practices of an educational community. For instance, where Educate Together is patron, the ethos of the school is ‘equality-based‘ – no child is discriminated against on the basis of their social, cultural or religious background in either access to the school or within the classroom during the school day. Like many other schools in Ireland, Educate Together schools are state-funded and teach the National Curriculum. They are non-fee-paying schools and are open to students of all backgrounds. They are co-educational and have no school uniforms. But they are much more than that: Educate Together schools work hard to instil a sense of equality and justice in students. They embrace the input of parents, students, staff and the wider community to improve the school in every way possible. They are committed to enabling students to achieve their full potential. All students are encouraged to explore their full range of abilities and are provided with equal opportunities regardless of their gender. Educate Together schools put students at the heart of all policies and practices. All children have equal access to school and no one religion or worldview is given priority over another in Educate Together schools. What are Educate Together second-level schools like? Learner-centred: The needs of students are considered first in all decisions. Students work together in mixed-ability classes for the majority of subjects and teachers use Twenty-first Century and active teaching approaches to enhance student engagement and learning. Democratically-run: Students, parents, school management and teachers are involved in decision-making and planning. Each group is represented on the school’s Board of Management. Equality-based: Students from all social, cultural, religious and non-religious backgrounds have equal rights and respect in the school. Everyone in the school community including staff and students are addressed on a first name basis. The school is mixed (boys and girls). An active approach is taken to challenging gender stereotypes and ensuring all students reach their full potential. Educate Together’s Second-level Blueprint (available to download below) underlines the commitment to a holistic educational experience where the development of students’ academic, social, sporting, artistic and musical skills is supported and encouraged through the school curriculum, co-curricular activities and cross-curricular teaching approaches. What does a 'democratically-run’ school look like? Educate Together schools are run on a democratic basis, encouraging active participation by parents and students in the daily life of the school whilst positively affirming the professional role of the teachers. Educate Together’s child-centred approach means that we put students at the heart of all policies and practices and involve them in decision-making where appropriate. What does an ‘equality-based’ school look like? In Educate Together’s schools, students are encouraged to explore their full range of abilities and are provided with equal opportunities regardless of their gender or identity. Are Educate Together schools anti-religious? 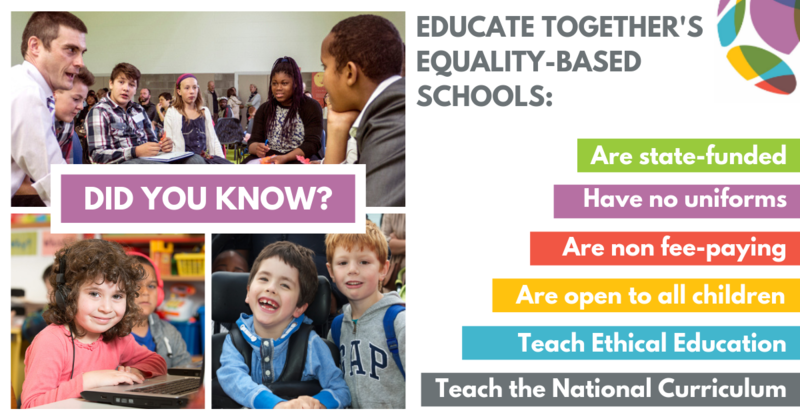 No, Educate Together schools are equality-based schools. One specific strand of Educate Together’s Ethical Education Curriculum aims to develop in children a critical knowledge, understanding and awareness of the teachings of religious and non-theistic belief systems and how these systems relate to our shared human experience. The Ethical Education Curriculum aims to inform rather than instruct. It teaches children about religions rather than teaching that one is ‘the right way to think’. We believe that specific religious formation is the responsibility of parents and religious organisations outside school. Within the school we aim to ensure that no child has to be set apart as a result of their religion. We also understand that many parents want their children to receive formal religious instruction. With this in mind, our school Boards facilitate the organisation of voluntary faith formation classes outside school hours, if requested. These classes are organised with the assistance of the relevant church authorities. Are Educate Together schools private, fee-paying schools? No, all Educate Together schools are state-funded, national and second-level schools, open to all. Educate Together schools get the same level of funding and follow the same guidelines as any other state-funded school. Our network includes a range of school types from small rural schools to large urban schools. About 20% of the total number of Educate Together national schools are part of the government’s Delivering Equality of Opportunity in Schools (DEIS) programme for schools in disadvantaged areas. All children are welcome in Educate Together schools. How can I get a place for my child in an Educate Together school? As each of our schools are responsible for their own enrolment, it is advised that you contact the school directly. You can pre-enrol for many of our schools on the school’s own website where you can also find the schools enrolment policy. What can I do if there is no Educate Together in my area? How does Educate Together decide where to open new schools? All new Educate Together schools are opened under the aegis of the Department of Education and Skills. It is the Department that decides what areas need new schools (on the basis of demographic need) and where they will be located. Where there is parental demand for Educate Together schools, Educate Together will apply to the Department for school patronage. I’m interested in working for Educate Together, are there any vacancies? Why is Educate Together a registered charity? Management bodies, like Educate Together, who open and operate schools on behalf of the Department, are given a small grant for doing so. However, less than 20% of our operating costs are covered by this core grant from the Government and we must raise the balance through trading, service delivery and fundraising. Educate Together is a registered charity and we rely on the financial support of individuals, companies and charitable trusts to deliver choice to parents and services to our schools. While we achieve a lot with what we have, fundraising support is badly needed and greatly appreciated. If I donate to Educate Together, how do I know my money is going to the right place? Educate Together is a registered charity and independent NGO with a track record of transparency and high standards of Corporate Governance. Educate Together’s annual reports, accounts and a list of all decisions made at the Annual General Meetings are all available online here.